While the days of having a robot housekeeper are still far in the future, the loveable household manager that cared for the home and well-being of the Jetson family is very much a part of our cultural consciousness. For a generation of children re-discovering the joys of The Jetsons, here are ten lessons that can be learned from Rosey. Robots Need Love, Too – Whether it’s her sweetheart Mac or her search for a husband, Rosey is a great example to kids that the quest for love is a complicated but essential one, even for robots. A Housekeeper Can Be Part of the Family – Like countless other sitcom housekeepers before and after her, Rosey helps kids understand that a household manager can be more “family member” than “employee.” Watching the tenderness with which she performs her duties and looks after the family is a great way for kids to see that domestic employees are certainly more than servants. Even Robots Miss Their Moms – A Mother’s Day poem written by the precocious Elroy is enough to send Rosey into a fit of homesickness and missing her “deactivated” mother. Because of their affection for her, the Jetsons attempt to restore Rosey’s mother; though the task proves impossible, George did secure the blueprints for her and the small viewers learned that you’re never too old or too metallic to miss your parents. Mental Illness is No Laughing Matter – After a repair job affects Rosey’s programming and turns her into a kleptomaniac, the family is forced to find a way to reverse the error. Watching this episode draw the line between a programming error and mental illness, and the importance of treating it properly, can help kids gain sensitivity regarding these issues. Don’t Underestimate Someone’s Capacity to Feel – The Jetsons don’t discount Rosey’s capacity for love and emotion just because she’s a robot; kids can learn not to underestimate another person’s ability to feel from watching their treatment of her. It’s Good to Have Someone in Your Corner – In her debut episode, Rosey socks the insufferable Mr. Spacely with a pineapple upside-down cake in defense of her employer George. While cake-on-boss violence is definitely not recommended, it can still be a good example of the importance of standing up for the ones you love. Romance Can Be Treacherous – When her robotic beau Mac is doomed to a permanent deactivation, Rosey becomes distraught. Though the efforts of the Jetson family saves the day, kids still learn a great lesson about the nature of relationships. 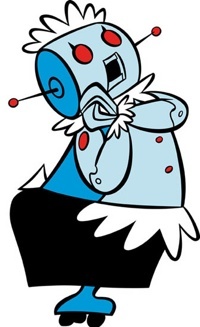 Cleanliness is Important – Rosey is utterly fixated on keeping the Jetsons’ home as clean as possible. For kids looking on, the importance of organization and cleanliness can be emphasized by her insistence on orderliness. Some People Are Simply Never Satisfiied – Despite the fact that Rosey handles the vast majority of household tasks, Jane Jetson has been known to sigh a time or two when faced with even the most trivial task. Seeing this behavior and Rosey’s reaction to it is a good way for kids to understand that some people simply can’t be pleased. Running a Household is No Easy Task – In addition to keeping the house up and running properly, Rosey is also often faced with such family-related dilemmas as keeping Judy from eloping. For kids, seeing everything that Rosey does can be a great way to understand just how much work goes into keeping a house running properly. Rosey is definitely one of the most memorable characters from the Jetson cartoon. Her lessons are sure to leave an impact.